NetMeter is a small, customizable network usage monitoring program. 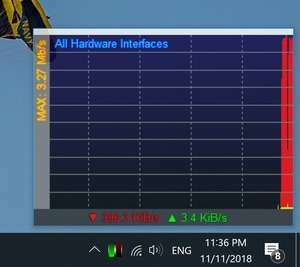 It can monitor NICs and dial-up adapters as well. Its main window consists of a graphical, resizable display and text labels (optional). Additionally a tray icon shows if there is in- and/or outgoing traffic. For security reasons, you should also check out the NetMeter EVO download at LO4D.com which includes virus and malware tests. Additional screenshots of this application download may be available, too. NetMeter EVO download been highly rated by our users.